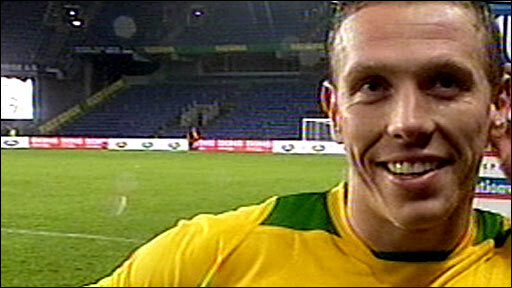 Captain Craig Bellamy's second half strike was enough to seal victory for Wales away in Denmark. The West Ham striker found himself in space inside the Danish half his low shot from 20-yards found the net. Bellamy and Manchester City striker Ched Evans both had chances to put Wales ahead in a lively first half. Boaz Myhill had to pull off a fine injury time save from substitute Martin Vingaard and later had help from the post as Wales held on for the win. All the pre-match hype was about Arsenal midfielder Aaron Ramsey who made his senior team debut. The 17-year-old put a fine performance and played his part as Wales had the better of the early chances in a fairly open 45 minutes. First, Tottenham defender Gareth Bale sent in a delightful through-ball which Jack Collison dummied and Evans saw his shot deflected away by Brondby centre-back Thomas Rasmussen. Then on 13 minutes, Dave Edwards found Bellamy who had Ramsey free in the box only to take the shot himself and side-foot wide. And nine minutes later, West Ham's Collison floated a ball over the top to Evans, but the youngster could not take it around the keeper. 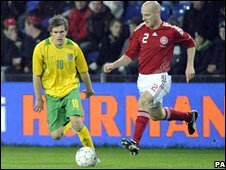 Denmark did create chances of their own though and caused the Wales defence some problems as they looked more in control on the ball. Rasmussen broke to the left-hand by-line and cut back which eventually found Brondby team-mate Michael Krohn-Dehli who dragged his shot wide. Arsenal's Nicklas Bendtner then cut the Welsh defence open to set up Morten Nordstrand and Hull stopper Myhill had to pull off his first save to keep the ball out. And on 36 minutes, Rasmussen tried his luck from 20 yards curling a left-foot effort just around the wrong side of the post. But Wales should have gone in ahead at the break, with Bellamy having the best chance of the half. He beat the offside trap to race through on goal but seemed to take one touch too many and sent his shot straight at Stoke keeper Thomas Sorensen. In the closing stages, Evans first had a shot blocked by the diving Rasmussen and then he lifted the ball over the bar at the near post from Bellamy's lay-off. Denmark came out of the blocks in the second half and should have scored twice in the first five minutes. Substitute Soren Larsen had Myhill beaten with his 25-yard effort which went inches wide, and the Toulouse striker was involved with their second chance. Aaron Ramsey played for 87 minutes on his senior debut. His strike from the edge of the box was saved by Myhill and somehow Leon Andreasen fired over from six yards out. Wales were finding chances hard to come by and both Evans and Bale were restricted to long-range efforts. As both sides rung the changes, the game looked like it was just going to peter out, but on 77 minutes, Bellamy popped up with the winner. Denmark pressed for an equaliser but Wales held on after Myhill brilliantly saved Vingaard's injury time strike and Larsen was denied by the post. Denmark: Sorensen, Bogelund (Andreasen 46), Agger, Rasmussen (Mtiliga 46), Kroldrup (Jorgensen 60), Kristensen (Retov 71), Norregaard, Nordstrand (Larsen 45), Krohn-Delhi (Vingaard 60), Bendtner, Rommedahl. Subs Not Used: Andersen, Ilso. Wales: Myhill, Gunter, Williams, Collins, Bale (Eardley 87), Edwards (Ricketts 46), Ramsey (Tudur-Jones 88), Nyatanga, Collison, Bellamy, Evans (Vokes 60). Subs Not Used: Hennessey, Blake, Morgan.